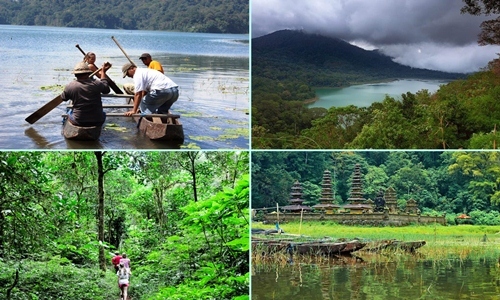 Tamblingan tropical rainforest is one of best trekking spot in northern Bali with duration 2 hours trekking to explore Tamblingan forest and past the lake with traditional boat ride or canoe. Visit Hindu temple in the forest which is a heritage of antiquity and still awake the beauty. For those of you who are nature lovers and wanted to see Bali nature, this tour is best choices which is Tamblingan Trekking is our main itinerary and then we will visit others interesthing places such as: visit Ulun Danu Temple, visit Bali Coffee plantation, visit Tanah Lot temple and then back to hotel. Please contact us now for best arrangement. Duration 10 – 12 hours, extra time $ 5/ hours. Entrance fee, lunch or dinner, Bali trekking is not include in the price.